Her Grace Nitaisevini Devi Dasi was born in Mumbai in a Gujarati Business family, conventional followers of the Pushtimarg. Later she with her family shifted to Hyderabad in 1984, since then she was closely connected to ISKCON Secunderbad. Inspired by Visits of many senior devotees, she later joined as a Full time devotee in 1997 and took initiation in the year 1998 in Atlanta,USA from H.H.Jayapataka Swami. She has completed her Graduation in Commerce, Masters in Education with a PG diploma in Management of Voluntary Organisation. 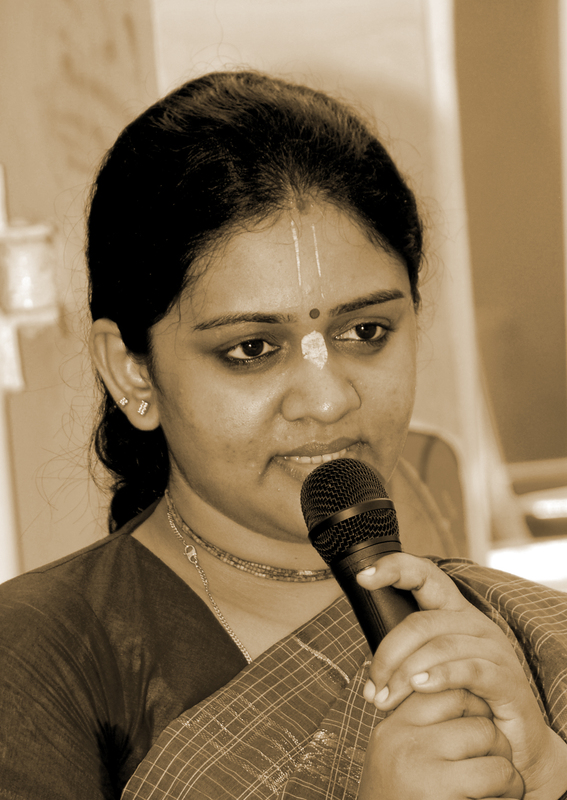 She is Perusing her PhD in Education from Andhra University,Presently she is the Principal of ISKCON's Divine Touch School, actively involved in Collection, Festival Cordination, Congregation preaching, College Preaching, and shouldering management responsibility with her husband H.G.Samba Das ,President ISKCON Visakhapatnam. She initiated Bhakti Yoga Residential Summer camp at Visakhapatnam where by school Children stay as a devotee for one week in the temple, which has been very successful program.